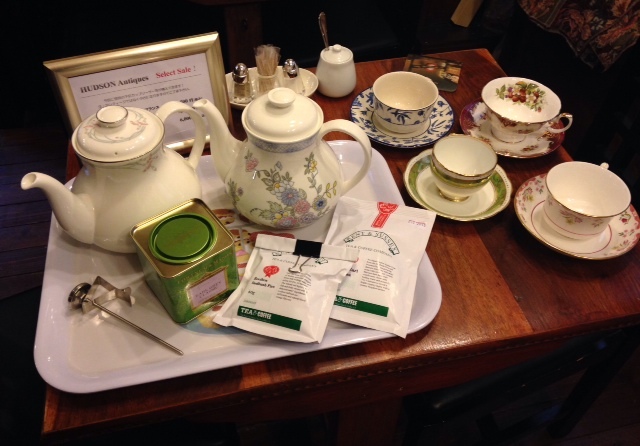 hudson antiques tea club – fancy a cuppa? Spring is just around the corner. Join me and try some delicious new teas as the spring flowers come into bloom. Our first Sunday event. Al at Al`s Cafe in Takadanobaba has kindly agreed to open just for us that day. Lots of different teas to try, and perhaps a Christmas Tea blend as well . . . . Ho Ho Ho !!! Join us for a festive end to 2015. We are expecting this event to be popular so please book well in advance to avoid disappointment. Now that summer is upon us, it was quite a challenge to drink hot tea for 90 minutes, but we managed it. Where there is a will, there is a way! 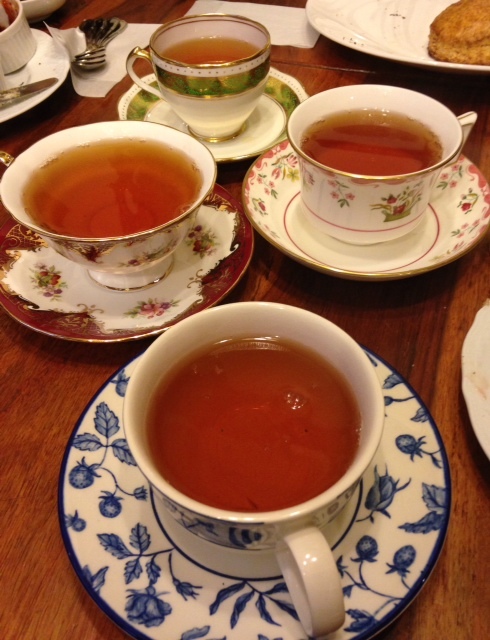 On Saturday 11th July, we sat down to enjoy three different teas. This time, instead of first introducing the tea to participants and then passing around the leaves to smell, I passed around the `mystery` leaves first, to see what people thought they might be – making our senses work harder to try to understand the tea. A bit of a guessing game in many respects . . . 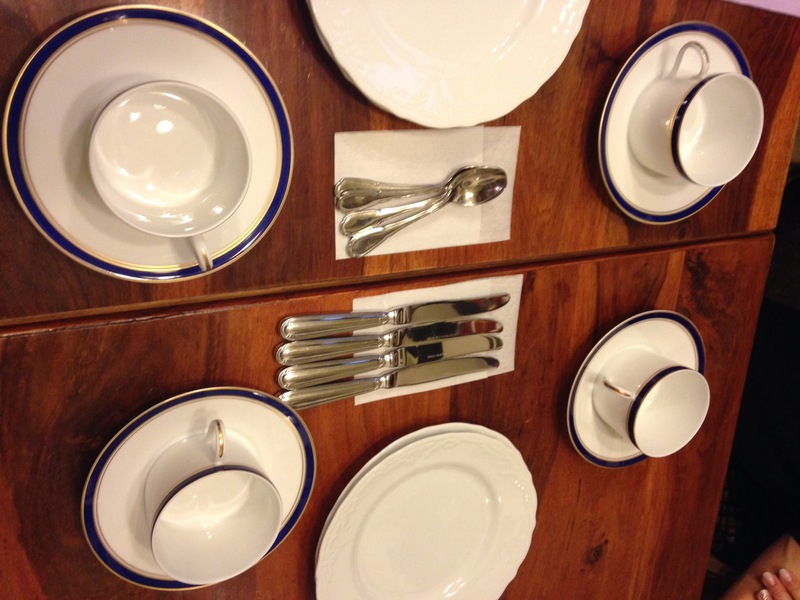 The china we used was two full sets, both Royal Doulton from England. One with a matching teapot (the blue flower print), while the other set (green) I matched with a German white teapot. The first tea was a Kenya Kosabei TGFOP Estate Tea. 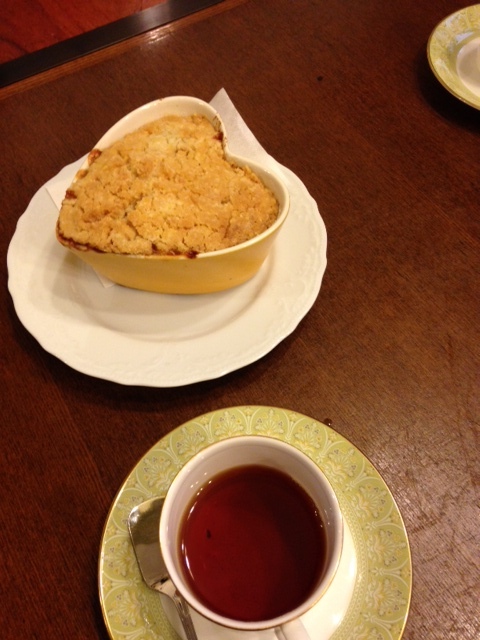 I have used this tea before at tasting, but it was the first time for July`s participants to taste it. In contrast to the last tasting, I used a lot more tea this time, making a stronger brew. This did make it more distinctive than last time, but we all failed to detect the `notes of toffee` that the description of the tea claimed. Personally. I enjoyed its clean lightness and thought it made a nice alternative to more mainstream black teas.The second tea we tried was called Benifuki, a black tea grown in Izumo city. Shimane prefecture in Japan. It is said that benifuki is the name of the seeds that were brought to Japan from India in the Meiji period. This darjeeling-like tea is extremely aromatic, and contains high levels of tannin. It was a very interesting flavour and all participants seemed to enjoy its uniqueness. 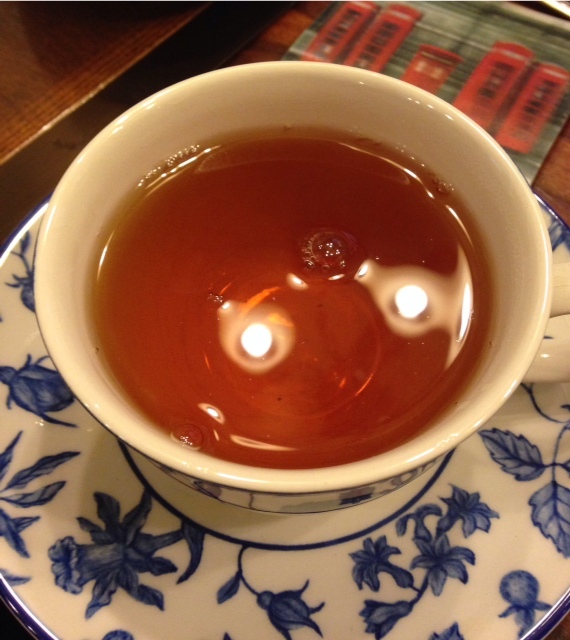 Many people commented that it was strange to drink a black tea that was grown in Japan. After the first cup of this tea, I added some dried Lavender to the teapot. I have also served the Lavender tea at a previous tasting. That time we drank it neat, just lavender and boiling water, which had little taste. This time I used it as an accent to another tea. I added it to the Benifuki teapot. 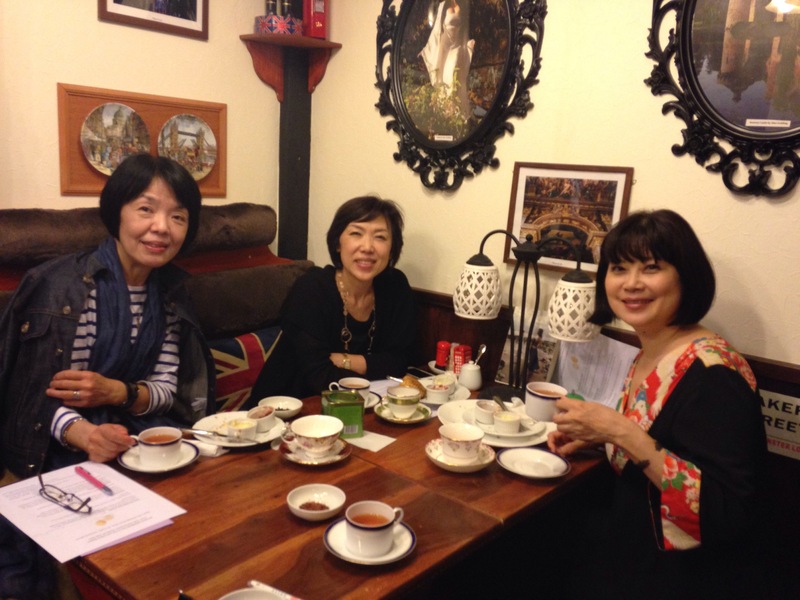 While it had only a very slight affect on the taste of the tea, it added a wonderful fragrance to our tea, which spread throughout the whole cafe and helped us all relax, and get tucked into our desserts. 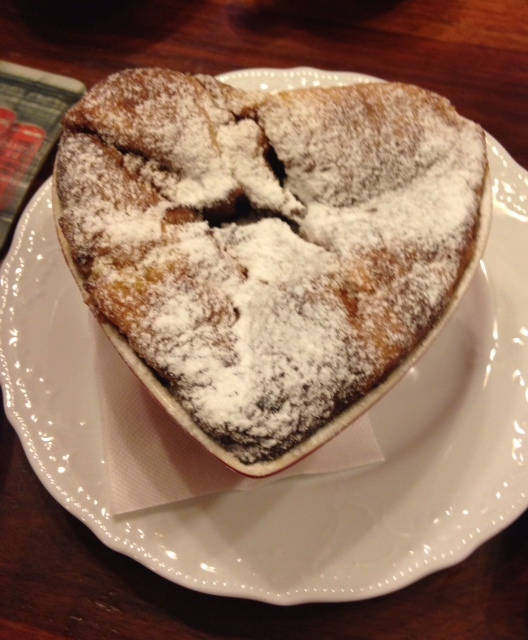 As it was a Saturday in the cafe we were able to chose from their full sweet menu. One member had the traditional scones with clotted cream and jam, two had apple crumble and two had bread and butter pudding. The third and final tea was a caffeine free Rooibos Redbush Fire tea from South Africa. This rooibos tea was infused with the scent and flavours of fresh oranges, and red safflowers. Visually, an extremely beautiful blend, which was lovely and refreshing to taste. This tea was voted the favourite tea by all participants. I urge everyone to try it, if you ever get the chance . 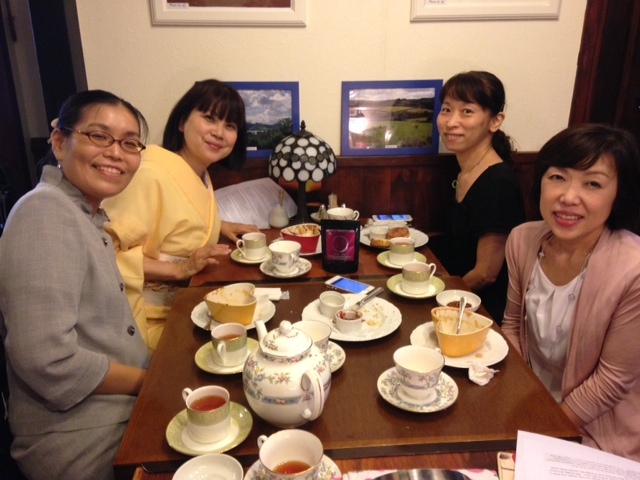 . .
On Friday afternoon, 6th June, I held the 4th Tea Tasting Event. The theme was `oranges`. 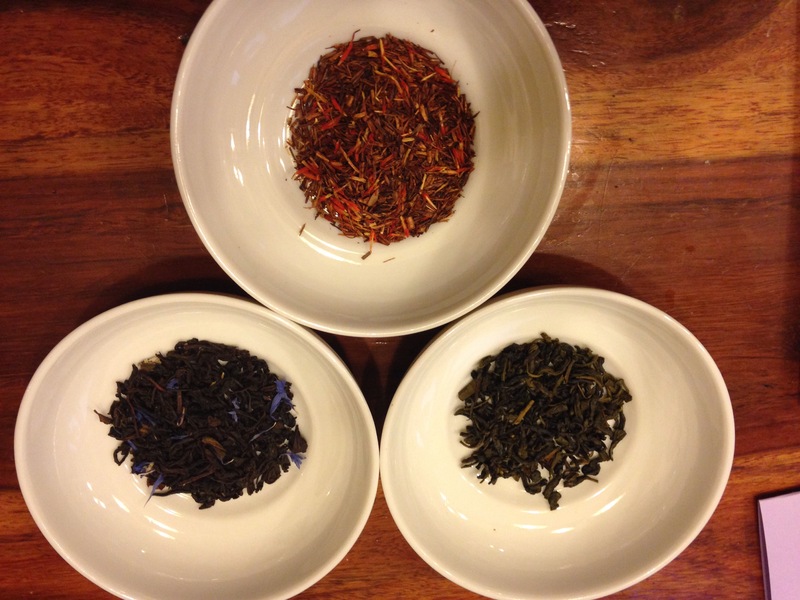 And we tried teas from China, Sri Lanka, and South Africa. We started drinking from some nice white. with blue and gold edging, French Limoges cups. 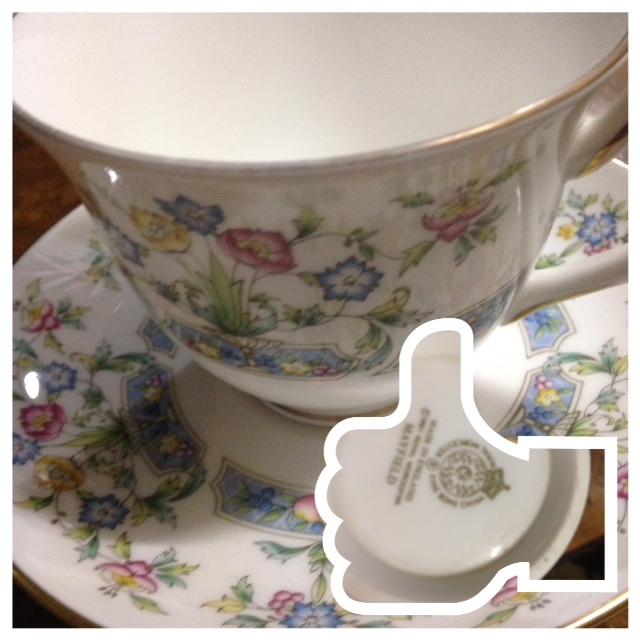 And then moved on to four different cups from the UK, Wedgewood, Elizabethan (Staffordshire), Stafford, and Roslyn. 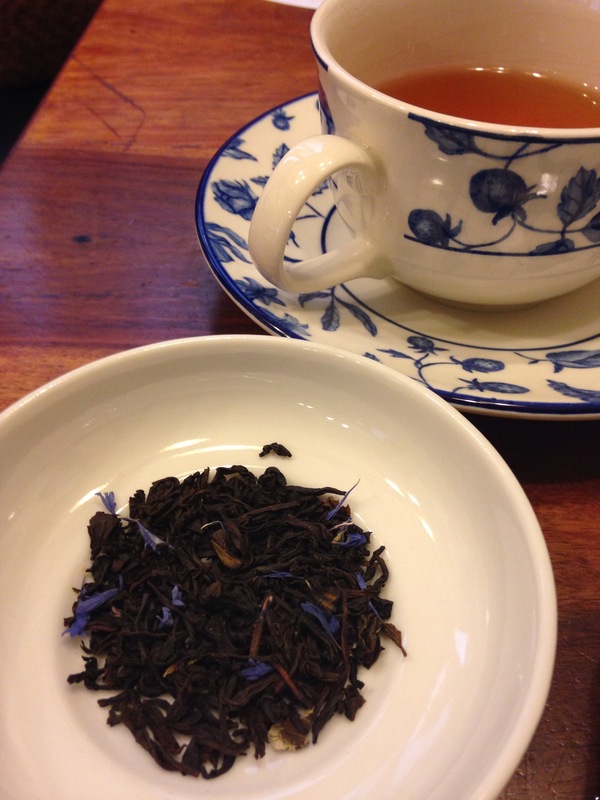 We talked a lot about Earl Grey tea and the history surrounding this particular blend of tea. There are many different theories about how this black tea with bergamot oil came known as `Earl Grey`. We tried two variations of Earl Grey. The bergamot is a kind of orange from Italy. While the shape and texture is like a typical orange, the colour is yellow – more like a lemon. It is this fragrant fruit that gives Earl Grey its distinctive aroma. 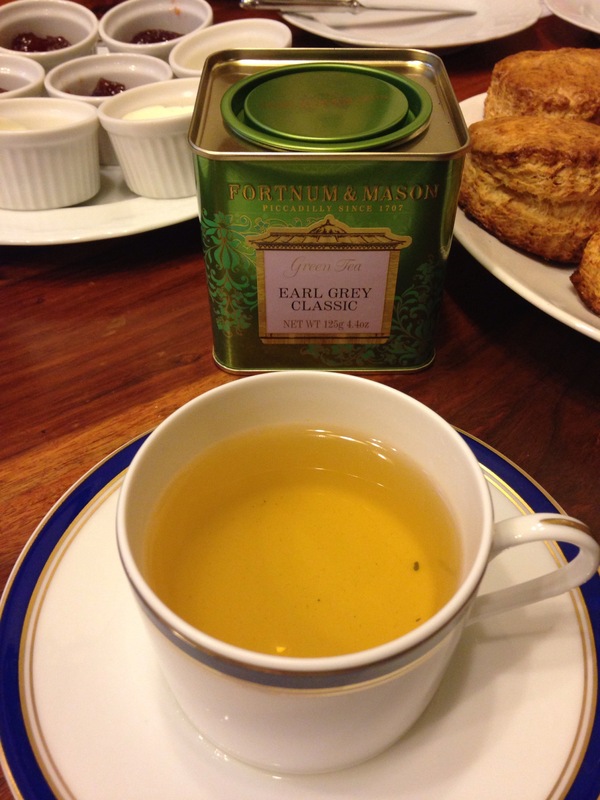 The first was from Fortnum and Mason, a Green Tea Classic Earl Grey. So instead of black tea, it uses a more delicate Chinese blend of green teas which needs to be brewed at a lower temperature of 85 degrees. All participants agreed that it was a unique taste and two of them voted it their favourite tea of the day. 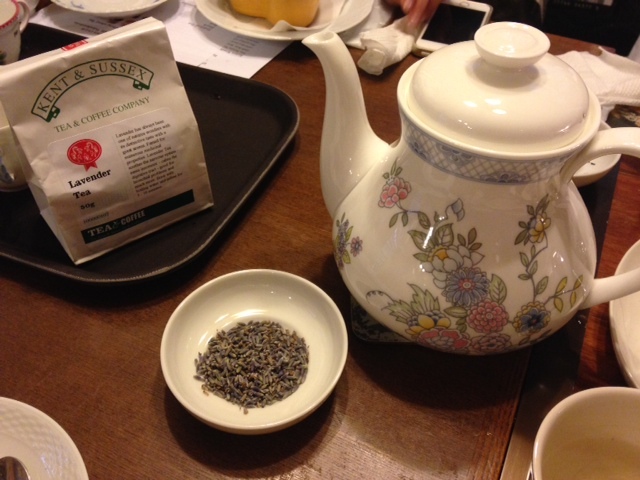 The second tea was by the Kent & Sussex Tea Company, their Cream Earl Grey Blend. This tea used a Ceylon black tea base from Sri Lanka. Added to that was blue cornflowers and cream flavours. It was hard to imagine what `cream` flavours would mean, but once we opened the packet and smelt the aroma it became much clearer. It had a very sweet aroma, almost vanilla in nature. We all then got very excited by this new version of Earl Grey. We drank it enjoying the sweet smell, along with our scones with real clotted cream and jam, kindly made for us by Al`s Cafe. 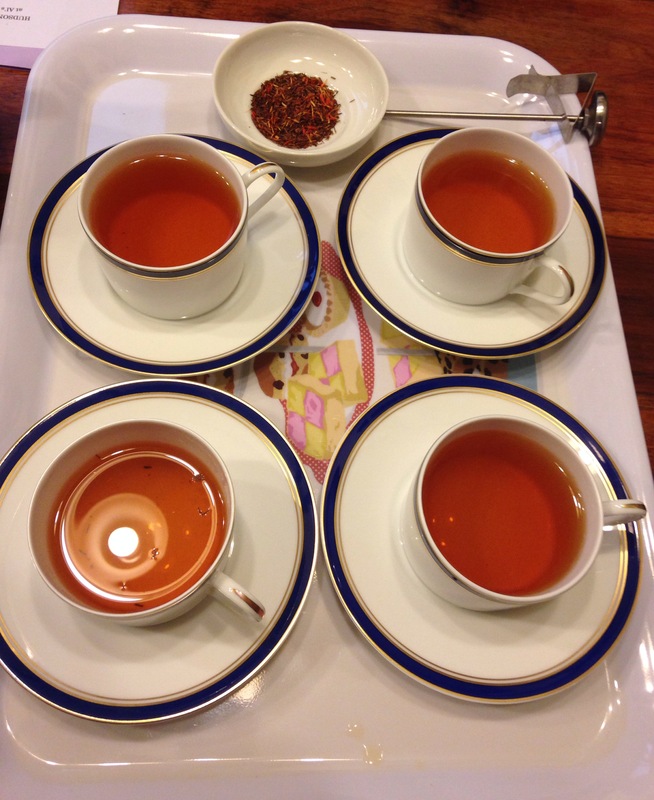 The third tea also used orange, but not bergamot oranges. This was also from the Kent & Sussex Tea Company, a blend called Rooibos Redbush Fire. Rooibos tea is native to South Africa, and added to this was lovely fresh orange flavours and vibrant red safflowers, hence the `fire` in the name. This was extremely fresh and clean, and a very refreshing twist on a regular cup of Rooibos. It was my favourite brew from today, and one which i would like to try in the future as an ice tea as well. 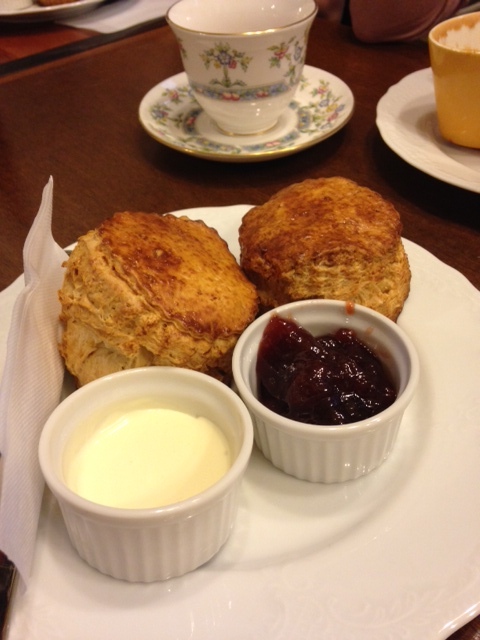 A very delicious, and ORANGEY, afternoon at the Hudson Antiques Tea Club. 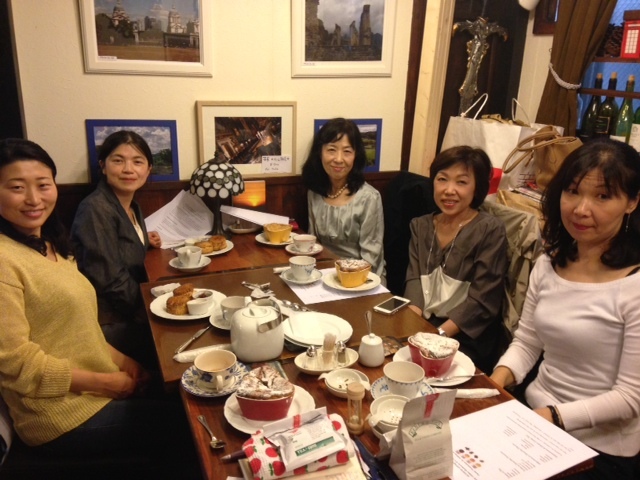 On Saturday 9th May, I held the third tea tasting event – the first one to be held on the weekend. Because it was Saturday, Al`s Cafe was also open to regular customers at the same time. This meant we didn`t have so much room to spread out. I think other customers were curious about what was going on at our table and the different aromas that were floating around from our teas. The first tea was a Kenya Kosabei tea. The colour was light and coppery. The taste was light and delicate. Quite different to darker blacker teas. There was a choice of three different desserts this time: April Crumble, Bread and Butter Pudding, and of course scones with jam and clotted cream. 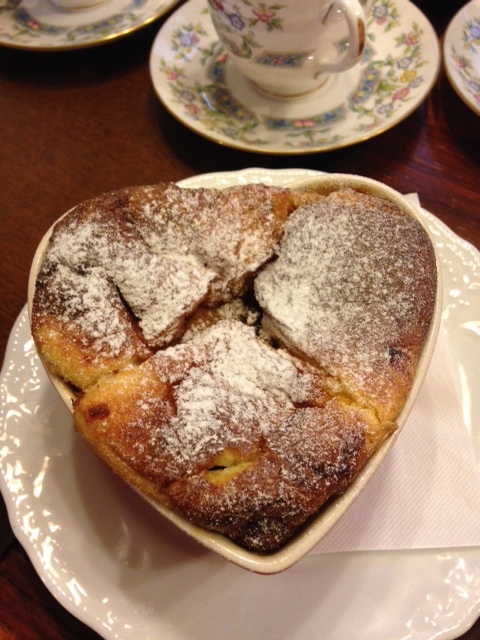 I chose the Bread and Butter Pudding. It is served warm, which makes it a really comforting dish. It was delicious and reminded me of home. I was joined by five ladies, all of them first time participants at this event. The second tea was one I have served before in the club (see first tasting results), a Lapsang Souchong Crocodile tea from Taiwan. As you may recall, this tea has a strong distinctive smokey aroma. For some of the participants it was too strong and they needed to add milk in order to drink it. One participant was a great fan of Lapsang Souchong, and the final student seemed divided. This is what makes tea tasting interesting I think. Teas don`t taste the same to everyone, and not all tea will be `your cup of tea`. Finding teas we don`t care for is part of the journey of tasting different teas from around the world. 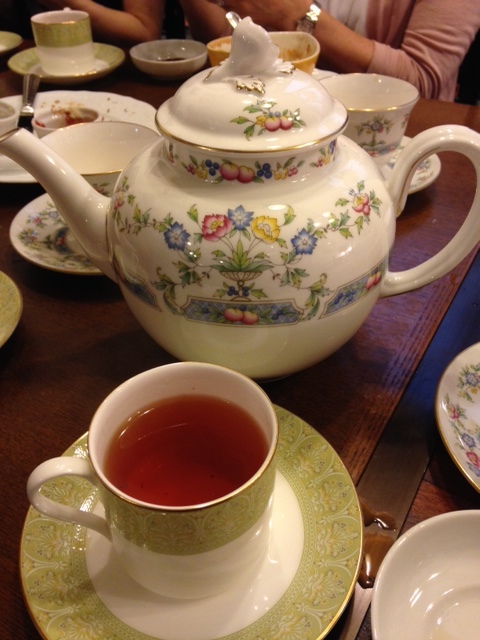 The final tea was a herbal tisane – Lavender Tea. 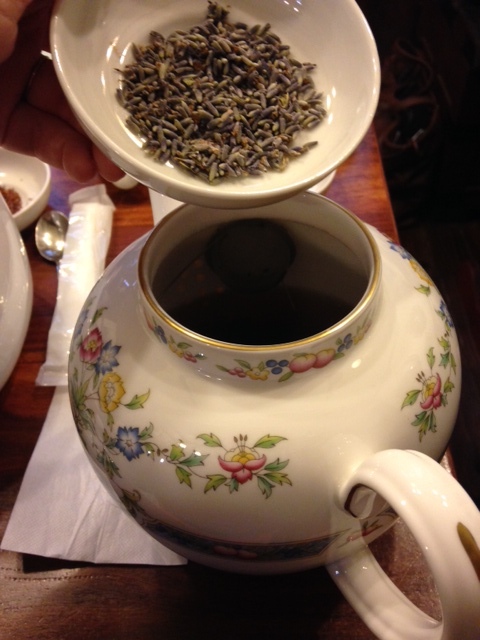 This tea was so fragrant and made the whole restaurant smell of lavender. I began to wonder if rather than being drinkable, it should have been used as a room fragrance? It took a long time to infuse, 8-10mins. In the end the tea was almost clear in colour and very soft. It was strange, because while it smelled so strong, the flavour was actually extremely weak. I think in the future I will add this visually beautiful lavender to a black tea, to give a black tea a bit of an `accent`. Perhaps this will be the best way to use this tea, by blending it with other tea leaves. 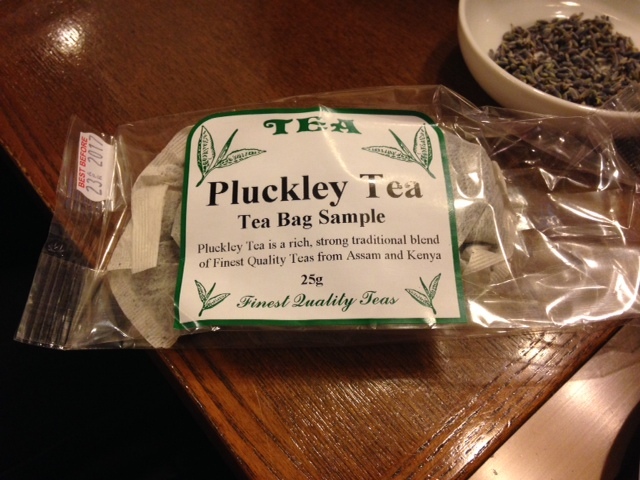 At the end of the class I gave participants some samples of Pluckley Tea to try. This tea is the signature blend of the Kent & Sussex Tea Company. This was the brand which all of today`s blends had come from. I imported them all especailly for the Hudson Antiques Tea Club. 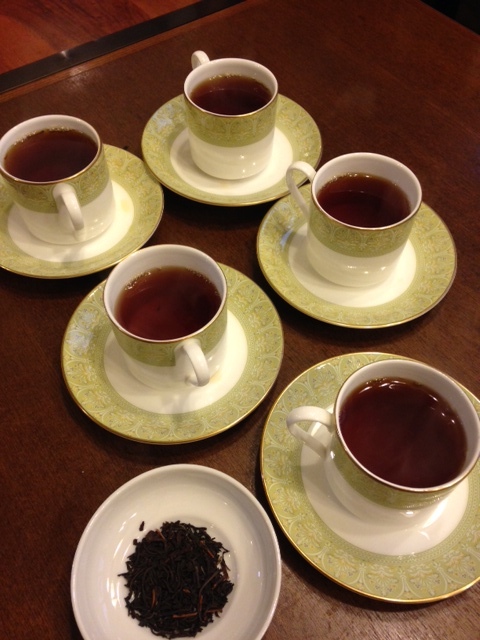 I look forward to tasting many more teas in June. Please join me !